William P. Kenoi is an American politician who served as Mayor of Hawaii County from 2008-2016. Before being elected mayor, Kenoi served as a legislative aide in the State House and State Senate, a law clerk, a deputy public defender, and an Executive Assistant to then-mayor Harry Kim. On November 1, 2016, then Mayor Billy Kenoi was found not guilty by a Hawaii island jury on all charges related to his alleged misuse of a purchasing card issued by Hawaii County. Kenoi was born in Kalapana, and attended Waiakea High School. Kenoi attended both Hawaii Community College and University of Hawaii at Hilo, but then transferred to University of Massachusetts Amherst in 1990, and graduated in 1993. Kenoi had transferred through the National Student Exchange program, and later became the NSE's President in his first year there. In 1992, Kenoi worked as an intern to Senator Daniel K. Inouye, during which time Kenoi attended the Democratic National Convention in New York City. Upon graduating, Kenoi worked as a Legislative Aide to State Representative Les Ihara, Jr. during the 1993 Legislative Session. He then occupied the same position in the State Senate during the 1995 and 1996 sessions. After graduating from the William S. Richardson School of Law at UH Manoa in 1996, Kenoi passed the bar exam on his first attempt and then served as a clerk for Judge Richard K. Perkins of the Eighth Division of the First Circuit. Kenoi then worked as a Deputy Public Defender, where he served in the Appellate, Family Court, Juvenile Criminal and Adult Family Court divisions, before finishing his career at the Public Defender’s Office at the Circuit Court. Beginning in 2001, Kenoi served as an Executive Assistant to Hawaii mayor Harry Kim, where he worked to address issues including crystal methamphetamine use, as well as homelessness and housing. Kenoi ran for mayor in 2008. Though Lorraine Inouye initially led in the opinion polls, Kenoi advanced to the general election against Angel Pilago. On November 4, 2008, Kenoi defeated Pilago by a margin of 55.6%–40.9%. At 39, Kenoi became one of the youngest mayors in Big Island history. Kenoi was re-elected mayor on November 6, 2012, narrowly defeating former mayor Harry Kim, 49.8%–47.6% – a margin of 1,438 votes. 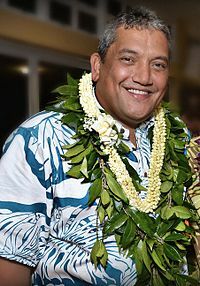 Former mayor Billy Kenoi reached his term limit after two terms, leaving office in December 2016. ^ a b Mari, Roger. "Billy Kenoi becomes youngest mayor in Big Island history". hawaiinewsnow.com. Retrieved March 18, 2013. ^ a b c d e f "Experience". billykenoi.com. Archived from the original on August 17, 2013. Retrieved March 18, 2013. ^ "About Mayor Billy Kenoi". hawaiicountymayor.com. Retrieved March 18, 2013. ^ a b "Education". billykenoi.com. Archived from the original on July 2, 2014. Retrieved March 18, 2013. ^ Midweek Printing. "Race In Big Island Mayoral Race". midweek.com. Retrieved December 2, 2014. ^ "GENERAL ELECTION - State of Hawaii - Hawaii County" (PDF). hawaii.gov. Retrieved March 18, 2013. ^ "Hawaii General 2012 - State of Hawaii - Statewide" (PDF). hawaii.gov. Retrieved March 18, 2013.